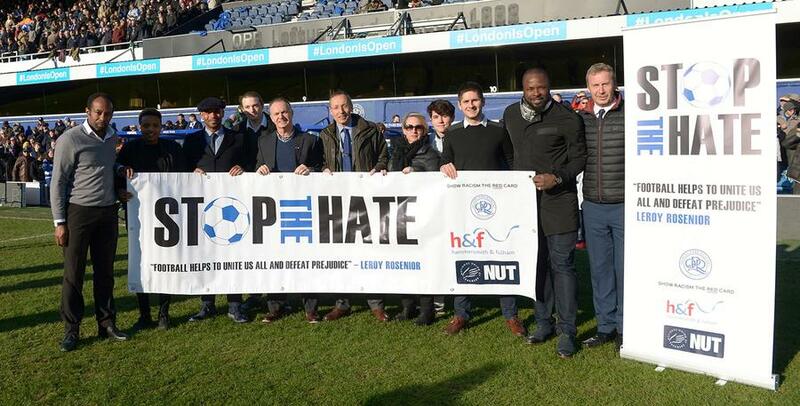 QPR in the Community Trust has this week launched a new ‘Stop the Hate’ programme in local schools to tackle hate crime. The programme, devised with Hammersmith & Fulham council, Show Racism the Red Card and the National Union of Teachers, will see QPR in the Community Trust coaches delivering workshops in five local schools to educate children about the dangers of hate crime, and support them to reject prejudice in all its forms. The workshops, jointly delivered with Educators from Show Racism the Red Card, will be followed up with an educational visit to Loftus Road, as well as teacher training funded by the NUT. QPR in the Community Trust and some of its partner organisations were joined at Loftus Road for Saturday’s game against Fulham by local MP Andy Slaughter, as well as former QPR players Trevor Sinclair and Danny Shittu, to launch the new programme. Mark Hopper from the National Union of Teachers said: "Teachers and schools have a huge part to play in empowering children and young people to recognise prejudice and racism when it occurs and empowering them to stand up against discrimination in all its forms. We are delighted that local teachers, school staff and pupils will be able to engage with Show Racism the Red Card's huge experience, resources and innovative approaches. The NUT nationally is a committed sponsor of SRtRC's work and we are proud to be supporting their work in our Borough." The project will be delivered in five schools in the north of Hammersmith & Fulham and offer teacher training opportunities for schools throughout the Borough.